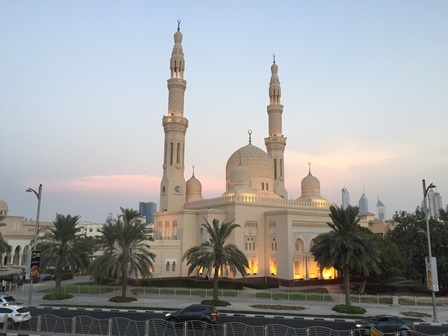 Bill and I just came back from the Arabian desert with a wonderful return visit to Al Maha Resort & Spa and the Dubai coast, followed by a spectacular room at Jumeirah Beach Hotel. Al Maha is a fabulous collection of luxury suites with private pools and oryx and small gazelle wandering around. The food is fantastic and daily excursions include displays of falconry including an owl and an eagle, camel rides, superb Arabian horses for experienced riders, and dune rides. After a couple of nights we were taken by our great ground agents to Jumeirah Beach for 3 days of sun and fun. The ocean was so warm you can stay in the water all day. The beautiful Burj al Arab continues to dominate the waterfront but is now dwarfed by the tallest building in the world – the Burj Khalifa, which stands at almost 3000 ft. Guests can visit the Observation Deck or have a meal at the top and the views are just spectacular! Emirates flies you direct to Dubai, and their new terminal in the airport makes you want to arrive early to enjoy all the amenities. When we send you to Africa, India or points beyond, consider a stop in Dubai. It’s a lot of fun and totally outrageous with skydome, 24 hour golf, spice and gold souks and some of the best hotels in the world.